With the birth of their first child imminent, the Duke and Duchess of Sussex have left Kensington Palace for their new home.Nestled in a quiet corner in the grounds of the grand Frogmore House in Windsor, Frogmore Cottage has a rich history - and Meghan and Harry are far from its first notable residents. 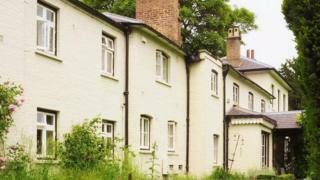 If Meghan and Harry are seeking a home hidden from the public gaze, then Frogmore Cottage is an ideal spot.From the very beginning it was intended as a secluded refuge from the pressures of royal life, with records of its occupants scarce. Queen Charlotte, wife of King George III, had it built in 1792 as a place for her and her daughters to escape the court. At the time it was fashionable for the wealthy to build large homes disguised as idyllic rural cottages.However, the queen also wanted somewhere for her daughters to "go off and escape George's madness", according to the writer and historian Helen Rappaport. "It was like a large retreat on the Windsor estate where she could go off and hunker down," said Dr Rappaport. "The king had bouts of madness. He was probably quite difficult to live with and she probably used Frogmore Cottage as a retreat." Abdul Karim, an Indian Muslim, arrived in England in 1887 to serve at Queen Victoria's table during her golden jubilee celebrations.The 24-year-old made such a big impact on the aging monarch that within the year he had become an established figure at court.The queen made him her teacher - or munshi - instructing her in Urdu and Indian affairs. She lavished honours, titles and gifts on him, one of which was the use of Frogmore Cottage.She visited him at the cottage "every second day" and "never missed a lesson" from Karim, according to the writer Shrabani Basu.Ms Basu, who discovered diaries detailing their relationship., said Victoria developed a close, almost maternal relationship with Karim and would sign letters to him as "your loving mother" and "your closest friend".Karim refurbished the house and lived there with his wives from 1893.However, his close relationship with the Queen angered her family and courtiers and her death in 1901 brought his life at Frogmore - and in the UK - to an abrupt end.Within hours of her funeral, the new king Edward VII, who "hated" Karim, had his residences raided and his papers destroyed. He ordered him to return to India, where he died a few years later, aged 46. "She was his protector," Ms Basu said. "It was curtains for him. They just cast him off." When Tsar Nicholas II and his family were murdered by the Bolsheviks in 1918, his surviving relatives fled to the UK in a warship sent by their close relative, King George V.Among them was the tsar's sister - and the king's cousin - Grand Duchess Xenia Alexandrovna. On arrival in the UK, the grand duchess and her children lived independently for a while but soon ran out of money.In 1925, the king put them up in Frogmore Cottage, along with several of her sons and their families. When it became too crowded, the king made the nearby Home Park Cottage available as well.Marlene Eilers Koenig, an expert on British and European royalty, said the grand duchess was "nearly destitute" by the point she moved in. Since World War Two, the cottage is believed to have been used as a home for members of royal household staff, although mystery surrounds it occupants.Perhaps this helps explain why the Duke and Duchess Sussex see Windsor as their "very special place".